Mowing too close; this causes scalping, moss, weeds and weed grasses such as annual meadow grass. Over watering; this causes a spongy bowls green surface, poor rinks, compaction, encourages annual meadow grass and fungal disease. Over fertilising; this causes lush growth and the subsequent slowing down of the green, can contribute to disease outbreaks, poor sward composition and unpredictable playing characteristics. Mowing too infrequently; this causes peaks and troughs of high performance and under performance of the green. mowing frequency is probably the most important factor in achieving consistent green performance. Top-dressing; the myth that bowls greens need to be top-dressed regularly is all about selling top dressing materials and services. it is not beneficial to the majority of UK bowling greens and in fact is detrimental to the health of the turf, soil eco-system, is costly and leads to long term problems with thatch, poor performance and localised dry patch. You can read in detail about how bowls green condition declines here. 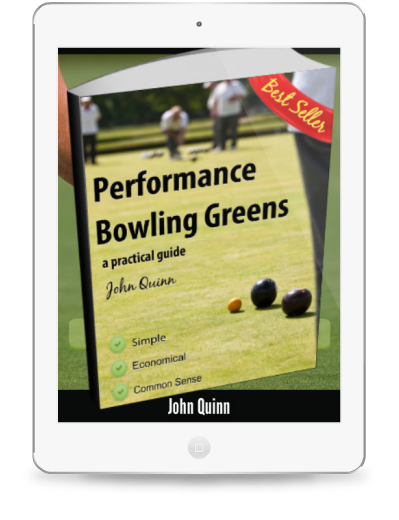 The answer to achieving a High Performance Bowls Green is here.